Technology has always relied on the theory of gradual upgrades. When we talk about television (TV) evolution, one thing that immediately comes to our mind is the new curved TVs that have taken the markets by storm. The major TV manufacturers are betting big on the curved screens by claiming that Curved TVs offer a better viewing experience than the flat TVs. Since the curved TVs are still in a pretty nascent stage, we thought we should let you know about our personal experiences of using them so that you don’t have to decide solely based on the plus points the popular advertisements show to you. Let’s start the discussion from the very beginning. 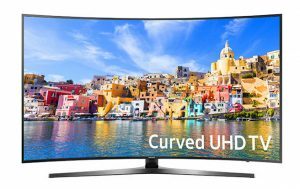 What is a Curved TV? As anyone can easily guess, Curved TV is the television that has a curved screen instead of a common flat one. The curved TVs have screens that are spherical in construction. However, instead of having a complete sphere which would need your entire room, and of course, a new architect to design the construction of your drawing room, the Curved TVs have the monitors that are just bent to a certain extent so that they resemble part of a spherical tube. The main claim in support of creating curved monitors is that a curved screen is a more natural shape to offer a good viewing experience as our round eyes’ peripheral vision is also curved to some extent. The supporters and manufacturers of curved TVs pointed towards more immersive experience, due to filling up more of our field of view apart from offering a wider viewing angle. The creation of Curved TVs dates back to 1974 when Xerox PARC researcher Nicholas K. Sheridon introduced a more flexible display device called Gyricon, which was the world’s first electronic paper display. He proposed it as an electronic Etch A Sketch, for a “paperless” office and this 40-year-old technology is probably the origin-point of today’s curved TV trend. Samsung introduced the AMOLED or the active-matrix organic light-emitting diode display technology for mobile devices in the 2011 Consumer Electronics Show. This became a reality in 2013 Las Vegas CES when Samsung and LG both presented the world’s first OLED TVs. The 55-inch Samsung OLED TV on display had “an IMAX feel,” according to Samsung Reps. In September 2013, Sony introduced the world’s first curved screen LED television which highlighted a unique curved screen. It provided a new way for viewers to experience the edge-to-edge curved construction that was engineered to offer a greater depth of feeling and allowed for a wider viewing angle. More Theatre-like Experience: Movie theatres that have curved screens have better ability to contain image distortion effects resulting from varied light distances in relation to the projector. Therefore, the curvature of the screen enhances the performance. Although most of the TVs are not run by projectors, many still argue that a curved screen is better for a more movie-like experience right in your home. More Immersive Experience: The immersive-ness has always been the strongest supporter of curved TV manufacturers. They argue that by curving the screen and thereby the image slightly forward, the view one is watching is made more ‘wrapped around’ the person, which projects the scenes that enter slightly more into one’s peripheral vision. This helps the watcher to get deeper into the visuals he/she is watching. 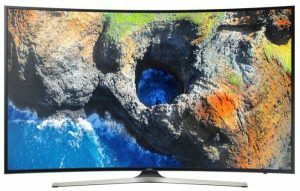 An Enhanced Sense of Depth: Many people who have curved TVs reveal that while watching a curved screen very initially, it looks like more of 3D while the source is still of 2D nature. Curving the edges of the visuals towards the viewer, in fact, enhances the cognitive perception of depth about the visuals. That is like, making the visuals more augmented to be consumed by our eyes. Samsung applies a variety of depth enhancement processes to its curved TVs to adjust the contrast in a changing ratio of various parts of the projected scene in order to better the sense of field depth. A Wider Area of View: A wider field of view increases the clarity of the visuals regardless of the viewing position of the watcher. Manufacturers claim that curved TVs are capable of providing varied and enhanced viewing angles which may or may not be totally correct. However, as curved TV screens draw the edges of the visuals inwards, they diminish the effect of light falling off without any fail. This helps the TVs enhance the correction factors related to image distortions which arise because our eyes do not have 100% perfect lenses. Bending the edges of a screen does another visual effect. When the image is curved towards the viewer, it makes one feel that he/she is watching a bigger image. If we draw straight lines from the watcher’s head position to the edges of the screen, the curved TV’s visuals would appear to stretch bigger and further across the wall than the flat TV’s visuals albeit the screen sizes are same quantitatively. This wider field of view helps the watcher see more detailed and bigger images, according to curved TV supporters. Better Contrast: Curved TVs focus the light coming out of the screens more directly into your eyes. The example usually provided is that of the satellite dishes that strengthen the density of signals by focussing the signals onto an LNB panel. 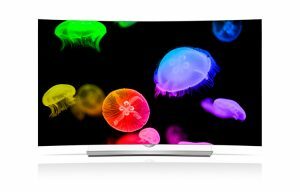 The Curved TV manufacturers also claim that as the light coming out of the screens are focussed onto the retinas of watchers, these curved screens can deliver between 1.5 times to 1.8t times higher contrast than flat TV monitors. Although the claim may not be accurate completely because curved screens and LNB panels are totally different in terms of their functions, most curved screen TVs do have excellent contrast features, that’s a fact. There are Problems with Reflections: Very similar to the trick mirrors at a fun park, the curved and differently shaped glass on the TV screen can make reflections weird. Unlike the flat monitors, if there is anything comparably brighter in your room, such as the direct light sources opposite the curved TV, there will be reflections on the screen that are weirdly stretched and distorted across a wider visible area of the monitor. This naturally makes the TV-viewing experience unpleasant, especially when you cannot switch off the light sources in your TV room. Although this sounds like a very big deterrent, one must realize that the actual problem of reflections is not very effective if the TV is placed in the right position in comparison to the sources of lights in the TV room. There may be Problems with Viewing Angles: As mentioned above, while the curved monitors help increase the contrast and color performance with its scientific off-axis viewing, it can usually make negative effects on the image’s patterns and geometry when viewed from the downside of the TV. However, to effectively feel this disadvantage, one would need to go around 35 degrees either side directly opposite to the curved screen. When one gets beyond 35 degrees, which can occur many times while watching the TV, images would turn almost unwatchable as the edges of the pictures nearest to the watcher start to look foreshortened against the further side. This also makes human brain do more hard work to make things look normal. Watcher needs to be at the Perfect Position: To get the best impact from the immersive and depth-enhancements, the watcher must be seated right opposite the center of the screen at an ideal distance. 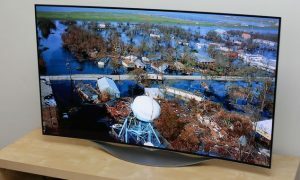 The 70-degree effective viewing arc offered by the TV manufacturers, however, make this effect a bit less problematic. It provides enough room for numerous people watching the curved TV at the same time. However, the perfect position of viewing is still quite small for curved TVs. The curved TVs usually depict this truly when they show how immersive the experience can be, albeit hiding this disadvantage being expressed to potential customers. Bigger is Better: While the curved TVs do claim that their contrast and immersive experiences are better, the TVs need to be big enough to provide all these experiences. As with us, the 55 inch curved TVs practically failed to offer any better viewing experience than the same-size flat TVs. The curved TVs that have a 65-inch monitor, however, excelled in providing the benefits they claimed. Therefore, the bigger the TV screen, the better is the viewing experience. Cost is also a Factor: The curved TVs are priced way higher than normal flat screens as they are portrayed to be cooler in looks and having better and pricey technologies to let them show better visuals to the watchers. For example, in the case of 55- and 65-inch models, the Samsung curved UNHU9000 series is priced $1,000 higher than the flat UNHU8550 series. At 78 inch models, the curved HU9000 is $2,000 pricier than the 75-inch HU8550. There might be many other factors that affect the pricing, but being curved seems to be the major factor inevitably. Curved TVs look pretty cool and provide you a great viewing experience. Here are the best five curved screens TVs that can offer you great pleasure along with a sophisticated TV viewing experience. The TV is ready to be plugged and played using three USB ports and/or four HDMI ports. The TV also allows you to seamlessly play online content as the smart TV is built with all avant-garde connectivity options. It is a UHD (Ultra High Definition) 4k TV that offers excellent contrasts and well-adjusted colors. The widescreen and curved design help the TV offer an experience available only in movie theatres. With a great quality of picture, color, and contrast, each self-lit OLED pixel in LG 65-Inch 4k Ultra HD 3D TV is designed to work with the others. LG’s unique curved TV design is a guarantee to offer you a great cinematic experience. This TV promises great viewing experience no matter what your seating position is; the TV offers great visuals even from the sides. The webOS TV is also preferred due to its feature of connecting seamlessly with the favorite online content. So if you want to catch up on Netflix or HotStar or other services, you can get a satisfactory experience altogether. LG 65-Inch 4k Ultra HD 3D Curved OLED TV is a very sleek, and stylish TV. The TV is no wider than a pencil at its thinnest section and it weighs only 54.5 pounds, allowing for easy installation and positioning anywhere in the TV room. With a life-like 4K UHD picture quality and a big 40-inch screen, the Samsung 48-Inch 4K Ultra HD Smart LED TV offers a great immersive experience. The PurColor and Peak Illuminator feature offer beautiful colors in a close-knit manner. The precision black local dimming and an auto-depth enhancer help the TV screen offer excellent contrast and picture enhancement without diluting the actual quality of the images. The picture quality, viewing experience, and the stunning visuals compensate for the smaller 40-inch size of the TV. There is an ultra-clear panel in the TV that helps minimize glaring. The Samsung TV also comes with a Smart Remote that includes intuitive control and point & clicks technology that helps the TV-handling feel like running a personal computer. The LG 55-Inch 1080p 3D Curved OLED TV offers pictures in bold contrasts in a set that is surprisingly sleek and stylish in design. LG’s “True Black” OLED technology that works without any backlight makes the TV much thinner than those with backlight features. The 1080p picture quality with notable sharp contrasts and tone makes the TV-viewing experience rich and satisfactory. The Smart LG Curved TV has a webOS operating system, offering the possibility to connect and surf the online streaming channels without any hard work, even if you don’t have a computer. There are 4 HDMI and 3 USB ports for you to enjoy the TV’s versatility and easy-syncing. The large TVs with the Ultimate Immersive Experience with the Extended Panoramic 105” Curved UHD lets you upscale Everything You Watch to 4K UHD. They come with Bluetooth capabilities, which means they can wirelessly connect to speakers and other devices. Learn about Bluetooth compatibility on your TV and get help connecting your devices. With an option to get connectivity with Bluetooth headphones, speakers and soundbars, and keyboards and gamepads, you can connect with a lot of external devices as well. You can also use your phone to control the TV, or if you lose the remote, you can replace the remote with your smartphone forever. The Samsung Smart View app that is usable when you stream content from your smartphone to your Samsung smart TV also lets you use your phone as a remote control with the Remote Control icon. The control options will automatically be displayed on the phone’s screen once you press the icon. This TV also has an Auto Depth Enhancer technology that analyzes portions of each image and automatically adjusts the contrast for a greater sense of depth. So, you watch everything in incredible detail that appears as more natural and immersive. There is also a UHD Dimming feature that precisely adjusts brightness to deliver deeper darks and brighter whites, eliminating the “halo” effect and image distortions, so that you can enjoy a crystal clear and vibrant picture quality. TV Size may sometimes feel like too huge, requiring a neat room-planning. There may be issues with brighter illuminations of other light sources. A pricey option; may need substantial investments. 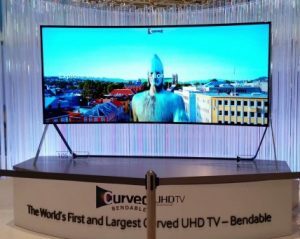 The prices of curved TVs depend on many factors and often are determined by the sizes of the screens and the kinds of technology used. For example, the RCA – 32″ Class Curved LED HDTV is priced at $169.88, while the Samsung UA65KS9000K 65 inch LED 4K TV was priced at around $880. Size is not a perfect determiner of the price though. For example, although some Samsung 65 inch TVs cost above $880 as mentioned above, the Lloyd L65UC 65 inch LED 4K TV is priced at around $1500. Brand values, however, are a determiner of prices though. For example, a lesser known Aisen A32HCN700 32 inch LED HD-Ready TV is available at around $220 as of January 2019. It is important to check the prices for the TV you want to buy because a lot of factors, such as Brand, Size, Technologies used, and the popularity of the model affect the pricing of the curved TVs. This purchase was probably my best decision till now. The TV never let me down. Even when the room was full of illumination from other light sources, the TV viewing experience was not hurt at all. I just used a dark room once to watch a movie and the experience was great then too. The TV is also very lightweight, so it did not take a lot of hard work to position it in better locations as and when needed. I would like to recommend this TV to everyone who likes big screens to watch movies and sports programs especially. This will never look like a wrong investment as long as you know how to keep it working in the best possible standards. I was first reluctant to buy such a large TV as I was not sure whether I would be able to manage the positioning with such a huge TV set. But, once I placed it in my living room, I had no regrets at all. The TV’s size is not a disadvantage and it is, in fact, a plus point. The images and colorful depictions in the large screen felt like a movie experience right since the first day. The TV is also good in terms of the image resolutions and contrasting features. I was able to view visuals that looked perfectly natural and there were hardly any blurring in the overall screen, including the edges. Sports and Movie experience was much better than my previous 65” Flat TV. The only disadvantage that seemed to bother was the issue of image quality when watched from a corner. But, since there is no one in my family who’d need to watch it from a corner, the issue was not a big factor. The images seemed to look disproportionate from sides, but that is not an intimidating factor as long as you watch the screen from the front. Overall, the TV is a good option for all who don’t mind investing a palpable amount on their TV sets. I would give it a 7 out of 10 stars.